10 sparkling diamonds are handset within this original Platinum Harmony Heart. There's lots of symbolism in this design, since this it was created to represent two people coming together in love. That's the 2 sides of the heart design. 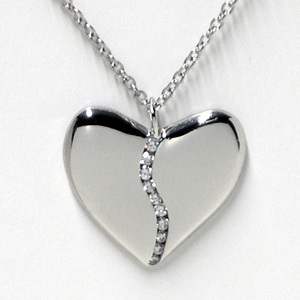 A matching platinum chain is also included with this platinum and diamond pendant (7/8" wide). It's available in high polish or satin finish. See our full selection of 10th Anniversary Gifts and 20th Anniversary Gifts.